Conny Klocker, intern at the Birkbeck Institute for the Moving Image (BIMI) and PhD candidate at the School of Law writes on a recent screening of 1930s propaganda film. As part of the UCL Festival of Culture, the Birkbeck Institute for the Moving Image (BIMI) was showing two propaganda films about the Italian invasion in Abyssinia in 1935/36 according to a programme first presented at the London Film Society in 1937. One film depicted a Soviet account of the events from the Abyssinians’ perspective, the other from the invaders, the fascist Italian perspective. The screening itself presented a difficult task for the two projectionists, who were doing a live montage of the films. Having to perform quick changes of 35mm film rolls, to work with two projectors at once, to rewind film rolls to the exact starting point and to turn projectors on ahead of their use to get their motor warmed up over and over again certainly includes complex manoeuvres which they performed brilliantly. In that sense, the Record of War screening could be rather seen as a performance by the two projectionists, not just as a screening. In 1937, Thorold Dickinson, the director of the programme shown at the London Film Society, saw an opportunity to confront his ‘fashionable Sunday audience’ with a challenging screening programme. The films were shown in dialogue to each other, with one depiction of, for instance the preparations for the war from the Italian side, followed by the war preparations undertaken by the Abyssinians. The chemical weapons attacks carried out by the Italian side followed by their impact on Abyssinian civilians. This direct interaction illustrated the contradicting narratives of the same event. And the audience in 1937 was seemingly not prepared for it. As one of the organisers of this year’s event, Henry K. Miller, pointed out, 1937 was ‘a time when seeing was often equated with believing’. 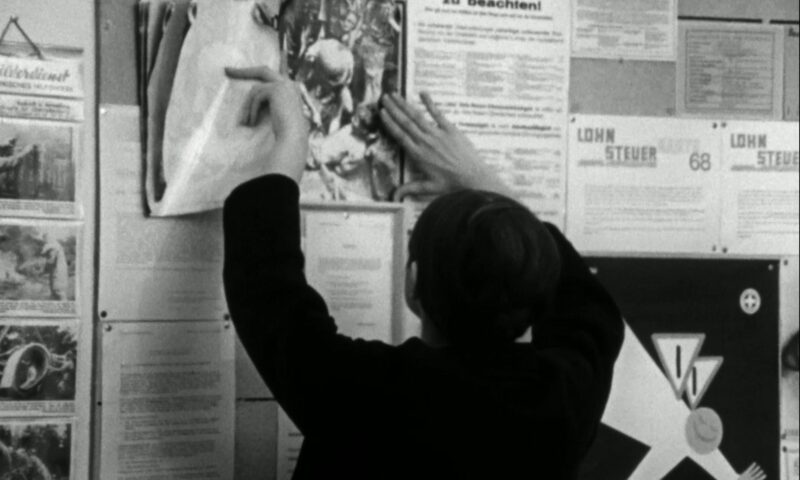 Film material on recent affairs was shown to the public only occasionally, for instance in cinemas before the start of the film screening. Taking up on this aspect, the reconstruction of the programme in 2017 (the third time that the programme has been shown in this form at all) appears timely. Although seeing does not equate with believing in today’s reality, it is rather a form of seeing but not believing. The sheer amount of film material on current affairs on offer on news portals or sometimes rather flooding one’s social media accounts might well lead to a certain degree of scepticism. Of mistrust or suspicion towards “the media”. However, the challenge presented to the audience in 1937 and the audience today has remained the same. It is a question of making up one’s own mind. Of consciously deciding to take a stand. And that of course, means to defend it if challenged. Today it appears that more and more people do not want to engage with their environment in that sense and most discussions on political issues come to a quick halt after everyone has repeated the most recent one-liners. Anything going further than that is rather considered an annoyance, something people do not want to engage with in their spare time. The resurgence of such sentiments requires to be challenged. And events such as the Record of War screening can contribute to that aim. Seeing the themes coming up during the invasion of Abyssinia and the way in which they were communicated by fascist as well as Soviet propaganda, one is invited to reflect on the presentation and narration of current affairs. 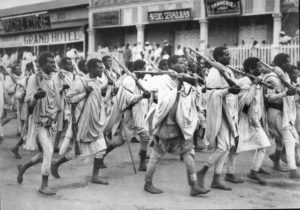 Of the glorious restoration of peace in Abyssinia by the Italians or the struggle for independence of the Abyssinians, trying to fight against foreign occupation and colonisation. Similarly, there are quite a few issues today which are framed in such contradicting, opposing ways by various interest groups. The question here is then, if one decides to take those narratives as presented and to repeat them unfiltered, or, if one decides to question those narratives and to take a stance.